If you watched any of the NFL games yesterday you probably noticed something a little different. From Peyton to Eli, nearly every player wore a little pink to help spread awareness for breast cancer. 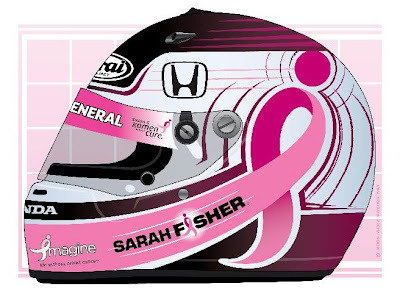 A few weeks ago when announcing the Pink paint scheme for the season finale in Miami, Sarah Fisher Racing also announced a competition to design her helmet. With nearly 70 entries, today it was announced Dean Ackerman of West Bloomfield Michigan was the winner. 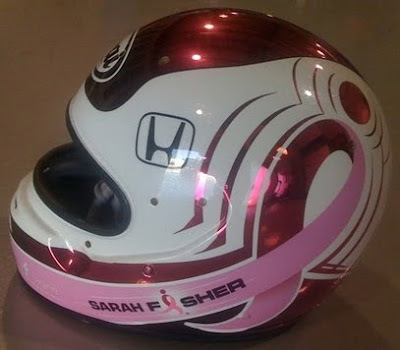 In addition to Ackerman's design being displayed at Homestead-Miami Speedway, he'll also receive a replica helmet signed by Fisher. As many of you know, Alex Lloyd will also help support the fight by dumping the #06 and using the #40202 this weekend. By texting "STAND" to 40202 you can donate $5 to cancer research and awareness. "Whenever I need help, I look to my fans. They have always been so supportive of me. This is a really neat way for them to get involved in this initiative with Komen, as well as a way to be in the racecar with me. I knew they would come up with an awesome design, and I'm so excited to show it off in Miami. I'm thrilled Sarah picked my design & even more thrilled that I will have the back-up helmet as my prize for winning!!! Thanks to Sarah, Klint(PR) , & Carey (the painter) @ SFR for starting my October off in a very cool way. I believe the primary helmet will be auctioned off ? Proceeds going to the Susan G. Komen group? ?